Not in the case of Israel! You would think that the 30 Billion Dollar$ GIVEN to Israel by the US Government annually (from YOUR tax dollars) was enough …. NOT SO! 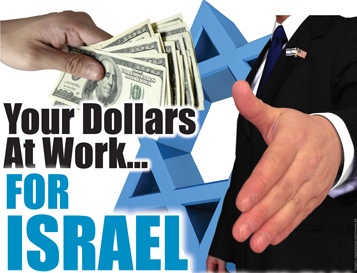 Most private donations via various zionist organisations to Israel are ALSO tax deductible Worse yet, these organisations maintain a Tax-Exempt Status, leaving even less in the US coffers that could and should be used for Social Welfare Programmes at home…. Just how long will this injustice be tolerated? And What happens if they lose that status? Donations intended for the ZOA given between February 2012 and May 2013 went to a donor advised fund maintained by an outside organization. The money still poured in via a ‘back door’. Back in Business: ZOA National President Morton Klein chats with Glenn Beck and Michele Bachmann at the group’s gala in 2011. The ZOA’s loss of its tax exemption was not revealed until the publication of a Forward exposé in September, eight months the revocation occurred. A March email from ZOA national executive director David Drimer, submitted as an exhibit in Arfa’s lawsuit, asked ZOA staffers to keep the revocation quiet. “In general, please do not broach this subject with donors unless it is absolutely necessary or they ask about it specifically,” Drimer wrote. “We firmly believe we can turn this around quickly through retroactive reinstatement so that assertively publicizing the current state of affairs will not be advantageous for the short and long-term interests of the ZOA.” An attached set of talking points prepared staffers to answer questions raised by donors. The revocation came after the ZOA failed to file three years’ worth of Form 990s, required financial disclosures filed annually with the IRS by not-for-profit organizations. Subsequent filings revealed that Klein received a 38% bump in his base compensation for the period during which ZOA failed to file its tax reports. Klein told the Forward that ZOA has now instituted organizational protections to prevent such filing errors from recurring, including the creation of a board committee to oversee the organization’s accounting operations. As of May 15, the ZOA is again able to accept donations itself. The ZOA canceled its annual gala in 2012, citing the loss of the group’s tax-exempt status and a serious illness from which Klein was recovering at that time. The group says its 2013 gala will now go forward. The keynote speaker will be Mike Huckabee, former Republican presidential candidate and Fox News host. Loews Corp. CEO James Tisch will also be honored. “We’re coming back with major people,” Klein said. iron dome” is an extra. But it doesn’t add up to 30 B $ a year – that was the total figure for ten years, set under the Bush regime, and it climbs each year. you cant believe the public numbers the governemnt gives us, you know darn well they are giving more to israel than $3.15 billion, that’s just for starters, they are getting much more on top of that, and then all the private donations, and then count the tax free status of the donation collecters, even more moeny sucked out of us.